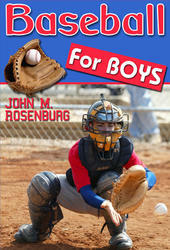 One of the most demanding activities on the elbow in sports is the baseball pitch. The prevalence of overuse injury to the elbow due to pitching is well docu-mented.12,18-23 Most of these overuse throwing injuries result from repetitive trauma to the elbow. An understanding and application of proper pitching mechanics can help to maximize performance and minimize the potential for injury. Although the baseball pitch is one continuous motion, dividing the motion into phases helps in understanding the elbow biomechanics during pitching. Werner et al. separated the pitch into six phases windup, stride, arm cocking, arm acceleration, arm deceleration, and follow-through.24 We provide next a description of the biomechanics of the elbow during each phase. In most overhead athletes who do not throw, the spectrum of UCL injuries can be managed nonoperatively, allowing even elite-level participation in most sports. However, reconstruction is indicated for athletes participating in sports that place high demand on the upper extremity, such as baseball pitching, javelin throwing, and serving. 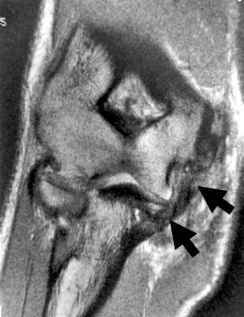 If nonoperative treatment fails, ligament reconstruction is a treatment option for overhead-throwing athletes who have pain in the medial aspect of the elbow or have a sense of movement in the elbow with the application of valgus loads during sports participation and have UCL laxity or rupture diagnosed on physical examination and confirmed by imaging studies. 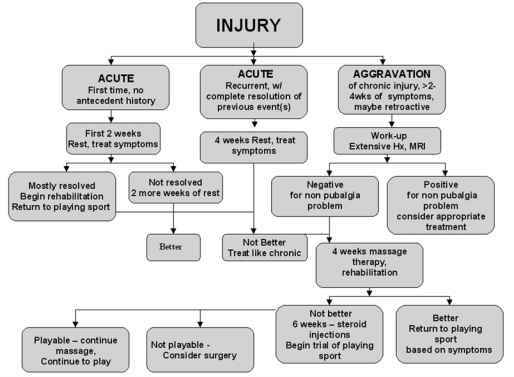 The surgeon should forewarn the patient that the recovery period following surgery is lengthy and that their sports requirements and aspirations should be consistent with this significant investment in attempting to restore a highly specific elbow function. 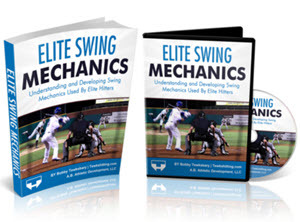 The biomechanics of throwing has been well described, and baseball pitching is recognized as one of the most demanding activities on the elbow in sports.16,17 The acceleration phase of throwing has been implicated in VEO (see Chapter 2). With repetitive valgus stress incurred during the acceleration phase over time, the ulnar collateral ligament (UCL), the humeroulnar articulation, and the flexor-pronator mass can weaken. 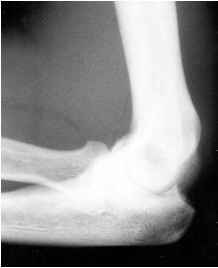 As a result, when the elbow is brought into extension, the olecranon is wedged against the medial aspect of the trochlear groove and olecranon fossa. 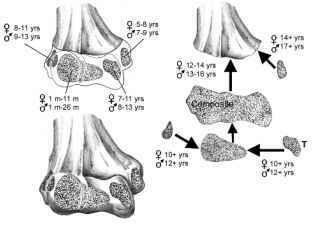 Because of this contact, impingement, chondromalacia, osteophyte production, and loose-body formation can occur (Fig. 10.1). Similar lesions can be seen, although less commonly, in the elbows of other athletes, such as tennis and volleyball players who place similar stresses on their elbows. Returned to participation at the same or higher level of competition for an average of 3.3 years. Patients should be counseled that this procedure is palliative, and recurrence of osteophytes or increased symptoms of instability may occur. Recently, questions have been raised regarding the possible stabilizing effect of the posteromedial osteophyte. Underlying incompetence of the UCL may be partially responsible for the development of the posteromedial osteophyte, and resection of the osteo-phyte may lead to increased stress on the ligament. Some patients may require subsequent reconstruction of the UCL. A recent follow-up study3 showed that the rate of revision elbow surgery was about 30 in professional baseball pitchers. Fifteen percent of these patients needed repeat osteophyte excision, and 15 needed UCL reconstruction. Patients who have revision elbow surgery have about a 50 chance of returning to their previous level of competition. Of the various sport participants who have had UCL reconstruction, baseball pitchers are the most difficult to return to their previous level of function. However, most athletes who participate in sports involving overhead-throwing motions and who have UCL reconstruction are able to return to their previous level of function. Jobe and associates reported that 68 of overhead athletes, most of whom were baseball players, in their series returned to their previous level of participation after UCL reconstruction.12 Fifty percent of the repair group returned to their previous level. The time to recovery differed between the two groups the repair group averaged 9 months, and the reconstruction group averaged 12 months. Athletes who had previous elbow operations had a lower chance of returning to their previous level of participation than athletes who had not had previous elbow operations.